Description: New York, 1922. Five-year-old Gavin Daly and his seven-year-old sister, Aileen, are boarding the SS Mauretania to Dublin—and safety. Their mother has been shot and their Irish mobster father abducted. Suddenly, a messenger hands Gavin a piece of paper on which are written four names and eleven numbers, a cryptic message that will haunt him all his life, and his father’s pocket watch. As the ship sails, Gavin watches Manhattan fade into the dusk and makes a promise, that one day he will return and find his father. The boy’s father kissed him goodnight for the last time – although neither of them knew that. The boy never went to sleep until he had had that kiss. Every night, late, long after he had gone to bed, he would lie waiting in the darkness, until he heard the door of his room open, and saw the light flood in from the landing. Then the shadowy figure and the sound of his father’s heavy footsteps across the bare boards. ‘Hey, little guy, you still awake?’ he would say in his low, booming voice. Okay, here’s the thing: Cleo, in the view I have had built up for me by Peter James would not be reading Fifty Shades of Grey, now would she. Description: Ove is almost certainly the grumpiest man you will ever meet. Every morning he makes his rounds of the local streets, moving bicycles and checking the contents of recycling bins, even though it’s been years since he was fired as Chairman of the Residents’ Association in a vicious coup d’etat. But behind the surly pedant there is a story, and a sadness. When one morning his new neighbours in the house opposite accidentally flatten Ove’s mailbox, it sets off a comical and heart-warming tale of unexpected friendship which will change the lives of one man – and one community – forever. The word-of-mouth bestseller in Sweden is Fredrik Backman’s debut novel. The main protagonist was born on his blog, where over 1000 readers voted for Backman to write a book about a man called Ove. 2/10 Ove misses his late wife so much. He decides to end it all and join her in the afterlife. 3/10 Ove remembers that Rune’s takeover of the Residents’ Association soured things for good. 4/10 Ove’s incompetent new neighbours have a habit of appearing at precisely the wrong time. 5/10 Ove finds a cat-shaped hole in the snow drift outside his house. 6/10 Ove appears to have some incompetent new neighbours. 7/10 After some gentle bullying by Parvaneh, Ove agrees to teach her to drive. 8/10 After a shaky start, Ove manages to teach Parvaneh to drive. 9/10 Against Anita’s wishes, the local authority plans to take Rune into care. 10/10 When the authorities come to take Rune into care, Ove and his neighbours are ready. Description: Christopher Fowler’s acclaimed Peculiar Crimes Unit novels crackle with sly wit, lively suspense, and twists as chilling as London’s fog. Now the indomitable duo of Arthur Bryant and John May, along with the rest of their quirky team, return to solve a confounding case with dark ties to the British theater and a killer who may mean curtains for all involved. For the crew of the New Strand Theatre, the play The Two Murderers seems less performance than prophecy when a cast party ends in the shocking death of the theater owner’s son. The crime scene is most unusual, even for Bryant and May. In a locked bedroom without any trace of fingerprints or blood, the only sign of disturbance is a gruesome life-size puppet of Mr. Punch laying on the floor. 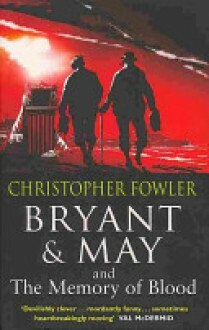 A full resumé of the characters by way of an introduction was very welcome, however after just a day away I still can’t elucidate the differences: Bryant and May are a team and that’s all you need to know. Description: He will not admit it to Rhea and Lars – never, of course not – but Sheldon can’t help but wonder what it is he’s doing here..
Eighty-two years old, and recently widowed, Sheldon Horowitz has grudgingly moved to Oslo, with his grand-daughter and her Norwegian husband. An ex-Marine, he talks often to the ghosts of his past – the friends he lost in the Pacific and the son who followed him into the US Army, and to his death in Vietnam. When Sheldon witnesses the murder of a woman in his apartment complex, he rescues her six-year-old son and decides to run. Pursued by both the Balkan gang responsible for the murder, and the Norwegian police, he has to rely on training from over half a century before to try and keep the boy safe. Against a strange and foreign landscape, this unlikely couple, who can’t speak the same language, start to form a bond that may just save them both. Frogner Park – Gustav Vigeland (1869-1943) worked on the sculpture park from 1924 until his death in 1943. Opening: It is summer and luminous. Sheldon Horowitz sits on a folding director’s chair, high above the picnic and out of reach of the flood, in a shaded enclave in Oslo’s Frogner Park. There is a half-eaten karbonade sandwich that he doesn’t like on the paper plate cradled in his lap. Nothing major at fault – it just proved to be an also-ran in my reading career. Three stars by the skin of its teeth.